Comment: Book is in good condition, shows light shelf wear. Book has light writing and highlighting. Front cover shows light wear, has light scuffs/marks. Fore edge may have light stains/marks and edges may be lightly kinked. For decades, the New Oxford Annotated Bible has been the most widely used study Bible in schools, colleges, seminaries, and universities across the nation, meeting the needs of students of all faiths. One of the most celebrated volumes in Oxford's renowned line of bibles, the RSV New Oxford Annotated Bible features an impressive array of supplementary materials to guide in readers' understanding of the scripture, including a protective two-piece box. Outstanding biblical scholarship, affordability, and thousands of satisfied readers have proven that the RSV NOAB is the best ecumenical resource available today. As close to the actual autographs as one can get, thanks to the incredible work of Bruce Metzger. This is what the great Orthodox Christian churches use when the Greek books are not readily available (outside of the Divine Liturgy -- for studying Holy Scripture). I enjoy my compact zippered RSV Bible so much that I wanted a full sized edition. 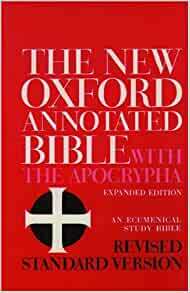 I decided on the Oxford Annotated Bible. The print is 10 point. It is very clear and readable. This Bible is medium sized and "just right" for me. The leather smells really good. It actually smells better than some of my premium Bibles. I enjoy the RSV translation because its literal, trustworthy and understandable. I'm at the age where I cannot see the point in having a literal Bible that I struggle to comprehend. I would like to understand what I'm reading the first time that I read it. And I don't want to question if its accurate or not. Its possible to have a trustworthy Bible that is readable and the RSV is an example of that. It is written on the middle school level. This edition contains the Apocrypha. Its in the back of the Bible. While I don't consider the Apocrypha to be on the same level as Scripture I do like to know what people are talking about when they reference it in different commentaries, etc. So its good to have. Overall this is a terrific Bible and for the price its a bargain. I will likely purchase another one for future use after I wear this one out. As far as translations go its probably the best out there. I wouldn't hesitate to put the RSV up their with the best translation into any modern language from the original Hebrew, Aramaic, Greek. Moreover its truly a bible in the original spirit of the word (bible originally means something like library or collection of books); So the RSV is as universal as any bible ever, since its found wide acceptance not only with mainline Protestants and Roman Catholics, but also with Orthodox Christians. And not only among the laity, but among Clergy and Scholars. And..for our Evangelical readers; indeed, the RSV is the parent tr of the popular ESV; I would say that the Greek Old Testament books more commonly refered to as Apocrypha or Deutro Canonical, would be a refreshing worthwhile treat to those not familiar with those valuable books, especially Sirach but also the other books, as one reads these its hard to imagine why some don't consider these books canonical. If its just a matter of these not being of Hebrew origin, I believe there's evidence of particularly Hebrew fragments partiuclarly for Sirach. The only thing I would say that doesn't appeal to me, is that these "apocrypha" are on a section on the back after the NT even the relevant essays and explanatory materials. It would have been fitting to put them in between the OT and NT. To me that would have made them seem more a part of the OT. In my mind these books are part of the Old Testament cannon. But oh well, nothing is perfect, so I consider that qualm as superficial.. This handsome Oxford Edition is well made, the red binding is a nice conservative shade of red almost "cardinal" the pages are thin but durable. Its actually not bulky at all especially when one considers its a study bible. it's actually compact and i would say is the I phone 5 of bibles. it feels good to hold. the font is good, and will appeal too young or old or tired eyes. the pages even smell good, reminds me of Church and Candles! its a study bible but the Editors (most seem to be IV leaguers) don't wear their religious ideas on their sleeves, yet one does detect a hint of their christian faith and reverence. Importantly, the text is continuous without bold paragraph titles so its free flowing as i imagine the originals were..I don't like popular paragraph titles or section titles for 3 reasons 1) they seem to make you focus on a particular point or theme in that section and we may miss out on other equally insightful ones, 2)the poetry or story seems choppy or interrupted and 3) i think the ancient authors intended for the text to flow in most cases. its so refreshing like reading anew. The original RSV by Thomas Nelson shares this quality with this Oxford Edition. All in all happy with this Edition. One will never really need to buy another bible. It may not be ideal or perfect for all readers, some prefer more devotional bibles, some more scholarly, However, nothing in life ever perfectly fits our ideal, and this edition is full of benefits. and for the price here on Amazon, I would say its a bargain. I remember seeing these at the book store a few years ago for $50 to $60 dollars. I hope this review helps, its the least I can do for the translators of this very poetic and worthy book and also for Oxford publishers. The layout and words are as expected and this is my favorite version of the Christian bible. However the pages are so super thin in this one that its impossible to turn them without wrinkling or damaging. Sorry I chose it and will be replacing with a sturdier printing. After years of using the NRSV, I decided to go back to the RSV which is somewhat more literal. An additional appeal to this Bible is that it is somewhat smaller and less bulky than the leather bound NRSV that I have been carrying around. The downside to going back to this RSV is that the annotations are not as up to date as those in the NRSV, and the RSV does not incorporate those texts from the Dead Sea Scrolls that you find in the NRSV. Overall, though, I like this Bible very much.